How compliant are you compared to your competitors? Who are they and how much stock do they have? How do you rank when a buyer searches or scans an EAN, UPC or ISBN? How much stock is available and selling through? What price range is the product being offered for? Where is the product from? Is it an import or locally distributed stock? 86 listings that are compliant with the policy returned in the top 500 Search results. 2928 units of stock from 82 unique sellers. Prices range from $31 USD to $91.50 USD. Here's the same report for a buyer searching by the keyword “Nba 2k17 Xbox one”. 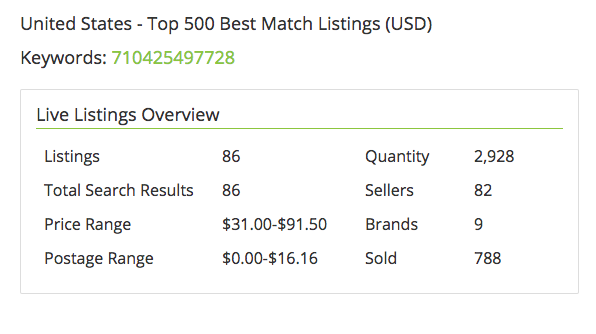 Notice the greater number of listings (244) being returned to the buyer, larger price ranges and stock available. Older PosteBay Top 500 Best Match Report Now Live!